Forum Dominator is a forum submitter tool that will help you efficiently optimize your time on message boards. With Forum Dominator, you can bookmark your posts and automatically check them for replies. You can also automatically insert your message into posting pages with one click. 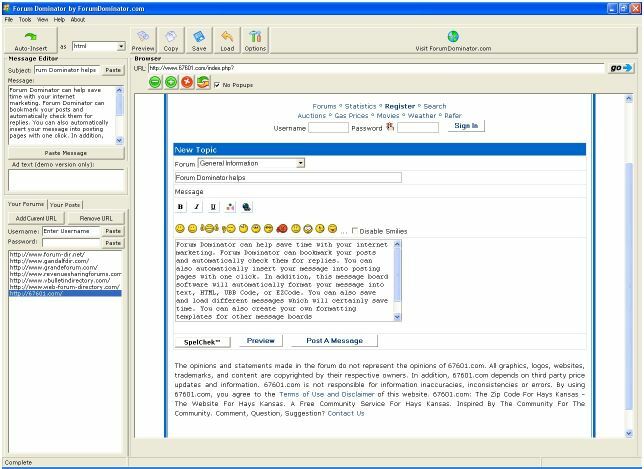 In addition, this message board software will automatically format your message into text, HTML, UBB Code, or EZCode. Qweas is providing links to Forum Dominator 2.214 as a courtesy, and makes no representations regarding Forum Dominator or any other applications or any information related thereto. Any questions, complaints or claims regarding this application Forum Dominator 2.214 must be directed to the appropriate software vendor. You may click the publisher link of Forum Dominator on the top of this page to get more details about the vendor.